Founded in 1955, Houston Ballet Academy is one of America’s foremost dance training institutions. The Academy is the official school of Houston Ballet, America’s fourth largest ballet company, which has been hailed by The New York Times as “one of the nation’s best ballet companies.” The school is named after Ben Stevenson, who served as artistic director of Houston Ballet from 1976 to 2003. The Academy offers courses in the Houston Ballet Center for Dance, a, six story, $47 million state-of-art facility in the center of Houston’s vibrant Theater District. The Center for Dance boasts nine spacious studios, a Dance Laboratory that seats 175 for fully-staged performances, and it is the largest professional dance facility in America. The Academy trains over 500 students each year. A signature initiative is its Summer Intensive Program, which attracts students from as far away as Japan, South America, and Australia to Houston to train for six weeks in June and July. The program offers a breadth of classes unmatched in other training programs, including courses in musical theater, scenic and costume design and a choreographic workshop in which young dance makers are partnered with budding composers to create short world premiere ballets. The process climaxes with several fully-staged performances of each level of the school in the Margaret Williams Dance Laboratory at the Center for Dance. Students enrolled in the upper levels of the school have the opportunity to dance with Houston Ballet’s professional company in such full-length classics as The Nutcracker, Swan Lake and The Sleeping Beauty, as well as appearing in world premiere works by Stanton Welch such as his 2013 staging of The Rite of Spring. Students in the Professional Training Program perform extensively with Houston Ballet II, Houston Ballet’s second company, which has appeared in Switzerland, Mexico, Guatemala, and cities large and small across the United States, dancing a variety of classical works as well contemporary pieces by Stanton Welch and other choreographers. Over 40% of the dancers in Houston Ballet’s professional company have trained in the Academy. Graduates of the Academy have gone on to win bronze, silver and gold medals at the International Ballet Competition. Over the last four years, the Academy has had five students win prizes at the Prix de Lausanne, with one student winning the overall competition and the audience favorite award in 2010. In 2012, over 90% of dancers in Houston Ballet II received contracts with professional companies. Academy graduates have joined prestigious companies across the world including American Ballet Theatre, the National Ballet of Canada, San Francisco Ballet, and the Hamburg Ballet. 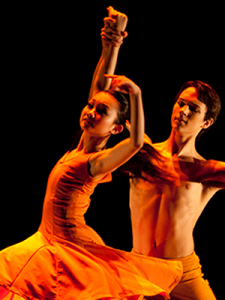 Visit Houston Ballet Academy for more information about the Academy and its programs.